Ink refers to handwriting or drawing content that has been input with a stylus or by touch. Windows Phone apps can support ink by using the InkPresenter element. The following illustration shows InkPresenter displaying ink strokes. In the preceding example, a Rectangle is added to the Canvas with the same margin as the InkPresenter element. This is because the InkPresenter does not have properties to provide visual boundaries. The Stroke property of the Rectangle is set to Black, which acts as the border for the InkPresenter. The z-order of the InkPresenter must be higher than that of the Rectangle. Otherwise, the Rectangle will hide the InkPresenter. 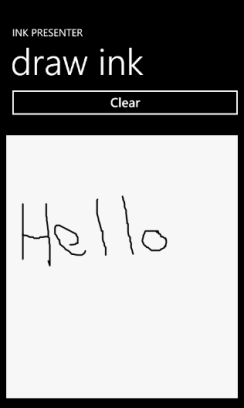 Ink in Windows Phone is a StrokeCollection object, which contains individual Stroke objects. Each Stroke corresponds to a stylus-down, stylus-move, and stylus-up sequence. A Stroke can be a dot, a straight line, or a curving line. Each Stroke contains a StylusPointCollection object, which contains individual StylusPoint objects. StylusPoint objects are collected when the stylus moves while it is in contact with the digitizer. The Stroke also has characteristics, such as height, width, color, and outline color, all of which are contained in the DrawingAttributes class. You can create or capture strokes programmatically by responding to the events on the InkPresenter. The events to handle are MouseLeftButtonDown, MouseMove, and LostMouseCapture. When the InkPresenter element receives a MouseLeftButtonDown event, a new Stroke object is created and added to the StrokeCollection object of the InkPresenter element. When the stylus moves while it is in contact with the screen, the MouseMove event is called and StylusPoint objects are collected and added to that Stroke. When the LostMouseCapture event is raised, the Stroke created is completed.